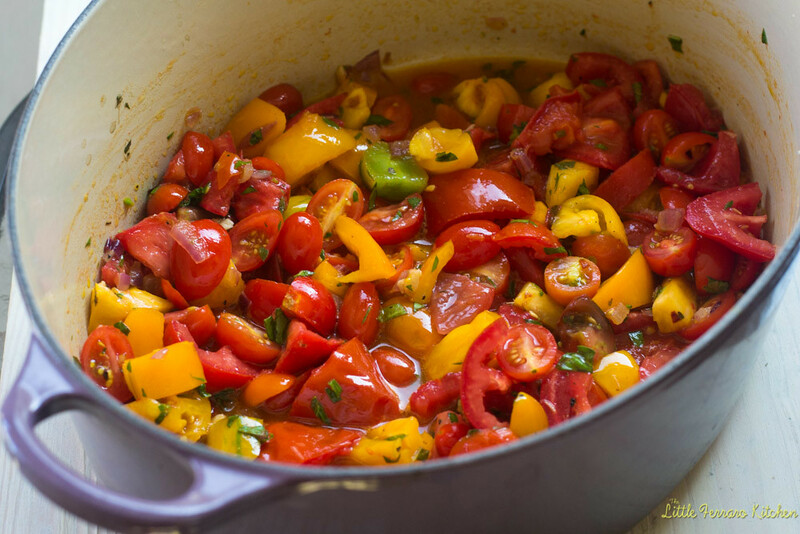 Just one more heirloom tomato recipe before we dip into soups and pumpkin. And I love..love fall! I love wearing sweaters and scarfs (that’s how far we get in Southern Cali and I’m cool with that). I love making big batches of soups and snuggling around a warm mug. I especially love my good hair days and not shvitzing from just walking the dog. That I won’t miss…the shvitzing. 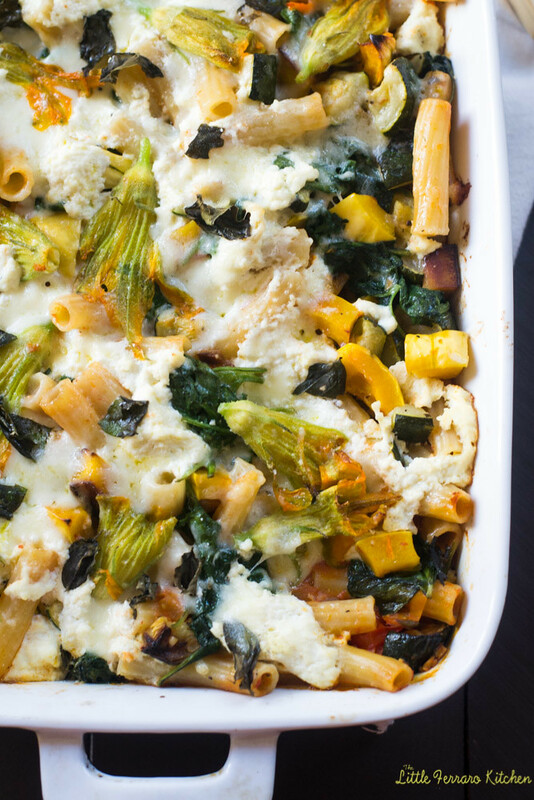 So let this farmers market baked ziti be a nice transition from summer to fall. 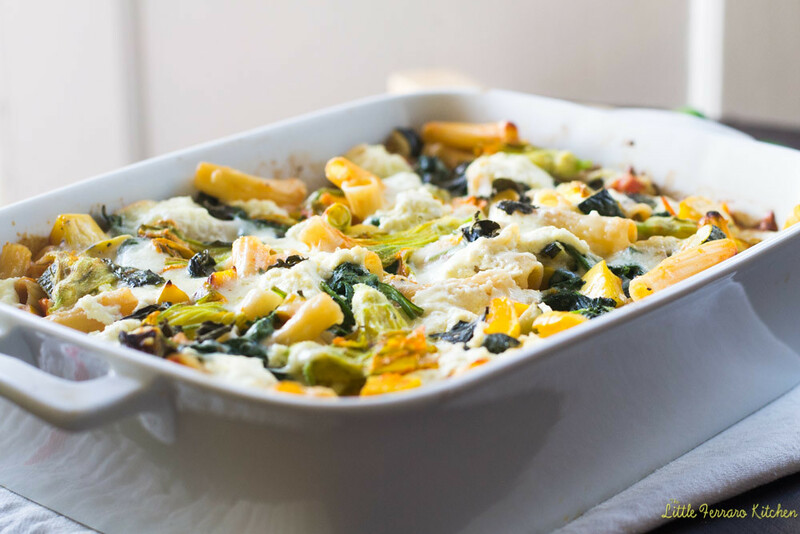 Full of summer produce with squash blossoms, zucchini and spinach and then gracefully move into the next season with it’s baked comfort. Of course you can use any veggies you have on hand. I have been obsessed with delicata squash and squash blossoms lately and the heirloom tomato sauce is light and fragrant. Get ’em while ya can! Also, this freezes very well! What I do is allow it to set in the fridge over night and cut into square servings. Then I wrap each piece in plastic wrap and place in a large ziplock bag and freeze. To re-heat, place in baking dish in the oven at 325 and bake until warmed through. In a large pot, saute 1 shallot in olive oil until it begins to soften, about 2-3 minutes. Add garlic, red pepper flakes and cook until garlic begins to caramelize, about another minute. Add chopped heirlooms and season with salt, pepper and white wine. Stir a bit and allow the alcohol to cook off, about 2-3 minutes or until wine is cooked away. Add basil and fresh oregano and cook until the tomatoes break down. Place a cover over the pot leaving a bit open and cook the tomatoes until they are all soft, about 20 minutes. 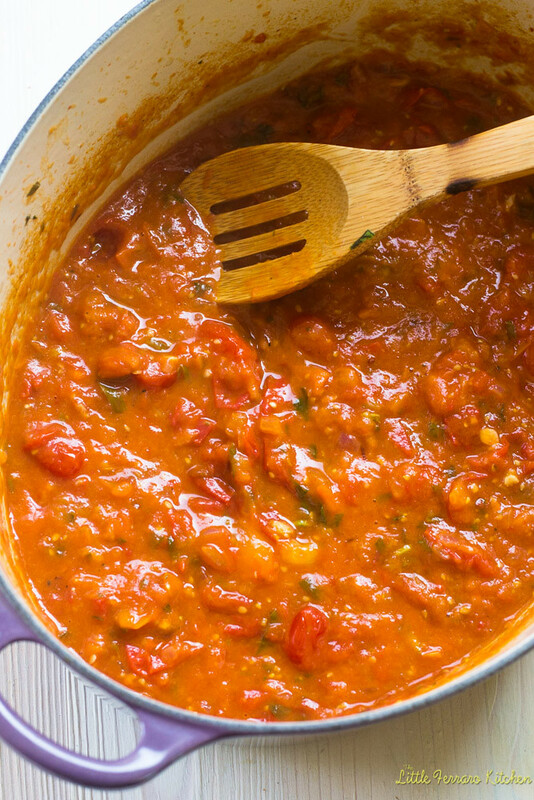 When done, use an immersion blender (or pour tomato mixture into food processor) and puree sauce. You can leave it as chunky as smooth as you want. Taste for seasoning. Pre-heat oven to 400 degrees F and line a baking sheet with foil. Add zucchini and delicata squash and toss with olive oil, salt and pepper. Roast in the oven until veggies are soft and caramelized, about 15-20 minutes. When done, set aside. In another pot, cook ziti in boiling water about 2 minutes less then package instructions. You still want the ziti to have a bite to it. When done, strain through a colander and set aside. You can also toss ziti with olive oil so it doesn't stick. In the same pot, cook the spinach until wilted. Ladel heirloom tomato sauce on the bottom of a casserole dish. Add the pasta to the rest of the sauce and toss to combine. 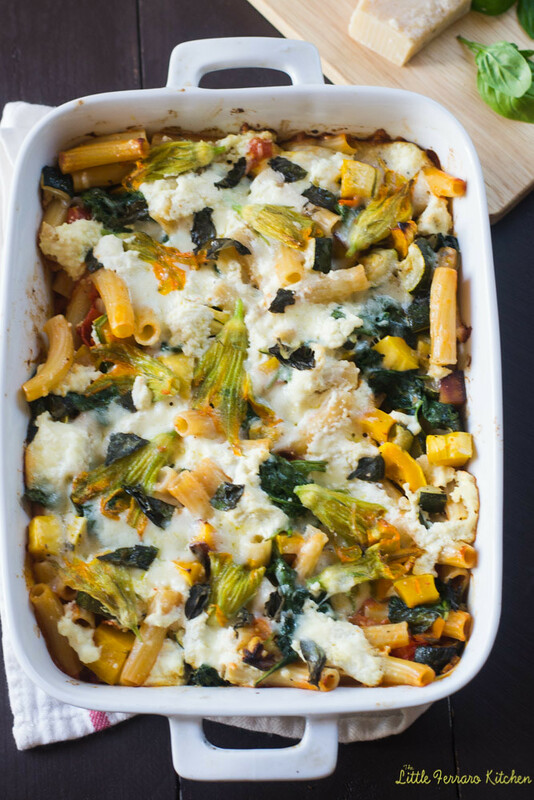 Pour the pasta into the baking dish along with the roasted veggies and spinach. Toss to combine. Dollop with spoonfuls of ricotta cheese and top with squash blossoms, fresh basil, freshly grated Parmesan cheese and a drizzle of olive oil. Bake at 375 degrees F for 30minutes, covered with foil, or until the cheese is all melted. I can almost TASTE this through your pictures! I am just sad that I don’t have a dish in front of me right now! Let’s hope your non-shvitzing days come soon! This looks absolutely incredible! Love every. single. ingredient. in this easy, cheesy delicious recipe! 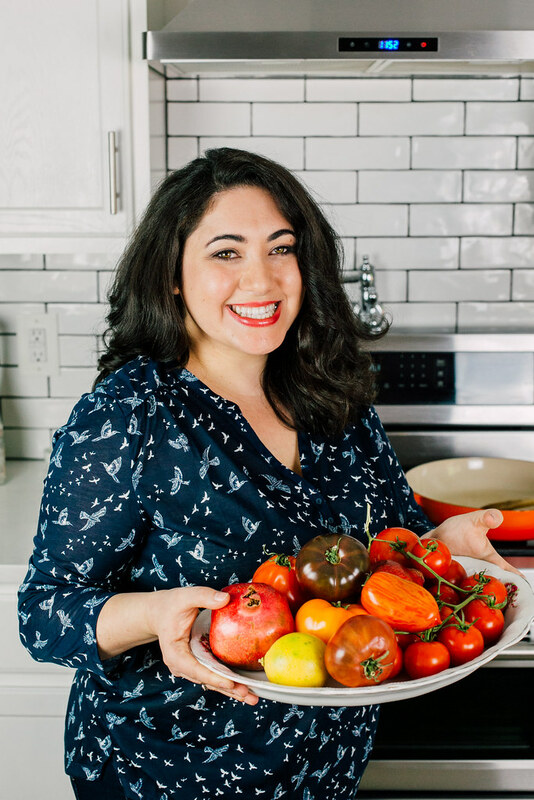 I have to make this, I sometimes feel guilty that I live in a place where our farmer’s markets go all year round, and right now the tomatoes are incredible! I do miss the crisp fall weather…but hooray for fresh produce! How perfect for fall time! I can get behind this with cool days ahead!